Will you be heading to Covent Garden this festive season? If so head to Central Avenue where a giant version of Miss Trunchbull’s chair is on display until January. We dare you to be brave like Matilda and take a photo sitting in the scary Headmistress’ chair. Upload your photos on Twitter or Instagram using #BeMoreMatilda for a chance to win a Matilda mini-break for you and 3 friends (including 4 tickets to Matilda The Musical at the Cambridge Theatre plus an overnight stay at top London hotel the Radisson Blu Edwardian, Mercer Street.). Five runners up will receive a signed Matilda The Musical poster. Do you dare to sit in the Trunchbull’s chair? This Competition is open to all residents of UK aged 18 years or over. Proof of age may be required. Employees (or family members of employees) of any group company of the Promoter, companies associated with the Competition and all affiliates of such companies may not enter this Competition. To take part in this Competition you must share a photo on Twitter or Instagram using #BeMoreMatilda of you sat in the Trunchbull chair in the Central Avenue in Covent Garden. We cannot accept entries by any other means. Maximum of one entry per person and per household. The Competition will run from 12pm, 04 Dec 2018 (the “Opening Date”) to 23.59pm on 6 Jan 2019 (the “Closing Date”) inclusive. Closing date: All entries must be received by 23.59pm (BST) on 6 Jan 2019. All Competition entries received after the Closing Date are automatically disqualified. If the Promoter has grounds to suspect any entrant or third party of cheating, deception or fraudulent or unsportsman-like conduct of any kind (including, without limitation, manipulating the Competition, choice of prize winner(s) or any entry) the Promoter reserves the right (in its sole discretion) to disqualify any entrant, entry or person it reasonably believes to be responsible for, or associated with, such activity. The Competition winner will be chosen at random from all valid entries. 1 winning entry (Selected Entry), and 5 runners up (Selected Entry) will be selected from all complete, correct and eligible entries received before the Closing Date. The Selected Entry will be notified by 18 Jan 2019 and will then have 14 days to claim their prize by responding to Matilda The Musical by the relevant social channel. If they have not claimed the prize by this time, another winner will be chosen. 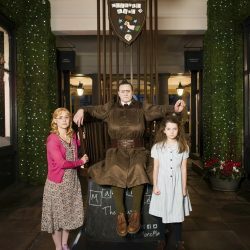 You agree that the Promoter may, but is not required to, make your entry available on the Matilda The Musical website uk.matildathemusical.co.uk and in connection with any publicity of the competition. You agree to grant the Promoter a non-exclusive, worldwide, irrevocable licence, for the full period of any intellectual property rights in the competition entry and any accompanying materials, to use, display, publish, transmit, copy, edit, alter, store, re-format and sub-licence the competition entry and any accompanying materials for such purposes. b) You have the right to grant the Promoter permission to use your entry in the ways described in clause 13 of these terms and conditions. e) Your entry complies with all terms and conditions of use applicable to the relevant social media platforms. a) Main Winning Prize: 4 tickets to Matilda The Musical at the Cambridge Theatre, London plus an overnight hotel stay at Radisson Blu Edwardian, Mercer Street. b) Tickets and hotel stay are valid until 23 May 2019 (excluding 11-24 Feb and 1-21 Apr 2019). c) The hotel prize is 2 x rooms valid for 1 overnight stay at Radisson Blu Edwardian, Mercer Street until 23 May 2019 (excluding 11-24 Feb and 1-21 Apr 2019). d) Tickets are non-transferable and subject to availability. e) The prize does not include travel or other expenses. Runners Up Prize- Five runners up will each receive one signed Matilda The Musical poster. If any winner is not able, for any reason, to accept a prize, or does not respond to the Promoter’s notification within 14 days of the draw date, the Promoter reserves the right to award the prize to another entrant. c) any act or default of any third party supplier, which are beyond the Promoter’s reasonable control. Details of prize winners’ names will be available for one month after the close of the Competition by writing to the Promoter at the address set out below and stating the name and closing date of the Competition. If you are the winner of the Competition, you agree that the Promoter may use your name and image to announce the winner of this Competition and for any other reasonable and related promotional purposes.